Today was the official launch of Katy Perry's new album, Prism. And online music retailer Amazon.com showed how a simple email marketing campaign is an example of great marketing. 1. Timely - On the eve of Katy Perry's new album and her album release party, I was sent this email. 2. 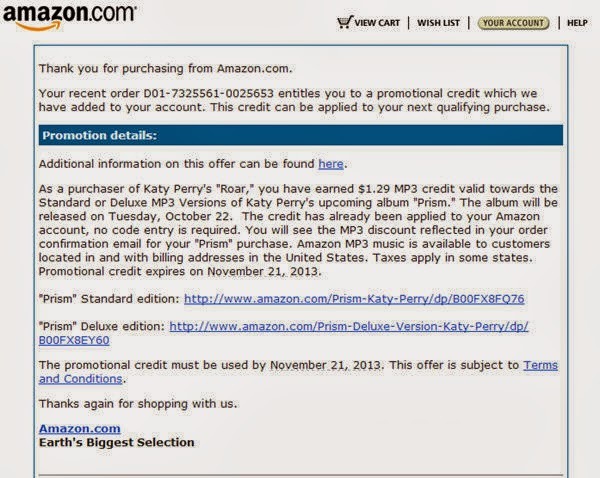 Transaction data driven - Amazon knew that I recently bought her new MP3 single "Roar" so I'm likely a Katy Perry fan and likely to purchase her new album. 3. Addresses an old customer pain point - I already paid good money for the first single off the new album. If I had known that I'd end up wanting to buy the new album, I could've saved the money I spent on just the single(s). 20/20 hindsight and a classic buyer's remorse. Bam! Amazon removed that concern by giving me a promotional credit for the cost of the "Roar" MP3 I recently bought. Great idea and one less excuse not to buy! But some constructive feedback for Mr. Bezos and his marketing team: Creative! They could've written a more specific and relevant title in the subject line of the email since we all know the subject line has a huge impact on the open rate. "Your Amazon.com Promotional Credit" is not very customized or compelling. While the copywriter is working on the subject line, have him work on the body of the email to not sound so robotic and sterile. I also think inserting the new album's cover art (shown below) would have been a nice addition. But, overall, a good idea. Kudos, Amazon!